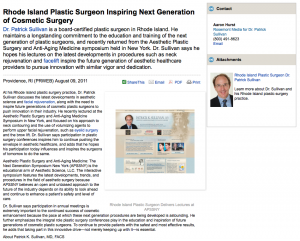 Rhode Island Plastic Surgeon Discusses Cosmetic Surgery Future - Patrick Sullivan, M.D. Dr. Patrick Sullivan is a board-certified plastic surgeon in Rhode Island. He maintains a longstanding commitment to the education and training of the next generation of plastic surgeons, and recently returned from the Aesthetic Plastic Surgery and Anti-Aging Medicine symposium held in New York. Dr. Sullivan says he hopes his lectures on the latest developments in procedures such as neck rejuvenation and facelift inspire the future generation of aesthetic healthcare providers to pursue innovation with similar vigor and dedication. At his Rhode Island plastic surgery practice, Dr. Patrick Sullivan discusses the latest developments in aesthetic science and facial rejuvenation, along with the need to inspire future generations of cosmetic plastic surgeons to push innovation in their industry. He recently lectured at the Aesthetic Plastic Surgery and Anti-Aging Medicine Symposium in New York, and focused on his approach to neck contouring and the use of volumizing agents to perform upper facial rejuvenation, such as eyelid surgery and the brow lift. Dr. Sullivan says participation in plastic surgery conferences inspires him to continue pushing the envelope in aesthetic healthcare, and adds that he hopes his participation today influences and inspires the surgeons of tomorrow to do the same. Aesthetic Plastic Surgery and Anti-Aging Medicine: The Next Generation Symposium New York (APSSNY) is the educational arm of Aesthetic Science, LLC. The interactive symposium features the latest developments, trends, and procedures in the field of aesthetic surgery because APSSNY believes an open and unbiased approach to the future of the industry depends on its ability to look ahead and continue to enhance a patient’s safety and level of care. Dr. Sullivan says participation in annual meetings is extremely important to the continued success of cosmetic enhancement because the pace at which these next generation procedures are being developed is astounding. He further emphasizes the integral role plastic surgery conferences play in the education and inspiration of future generations of cosmetic plastic surgeons. To continue to provide patients with the safest and most effective results, he adds that taking part in this innovative drive—not merely keeping up with it—is essential. Dr. Patrick Sullivan was named in Woodward and White’s “Best Doctors in America” as a top plastic surgeon, and included in the Castle Connolly Guide to America’s Top Doctors, in addition to being named a “Top Doctor for Women” by Redbook, and being voted top plastic surgeon by peers and nurses in a survey conducted by Rhode Island Monthly Magazine. He regularly publishes in professional medical journals, as well as national magazines and newspapers, on a variety of topics ranging from neck lift, facelift, noninvasive body contouring, and recent breakthroughs in aesthetic surgery. Dr. Sullivan is certified by the American Board of Plastic Surgery, and is a member of the American Society of Plastic Surgeons, and the American Society for Aesthetic Plastic Surgery. Dr. Sullivan’s plastic surgery practice is located at 235 Plain St. #502 in Providence, RI 02905, and can be reached at (877) 435-FACE, or found online at drsullivan.com or http://www.facebook.com/doctorsullivan.